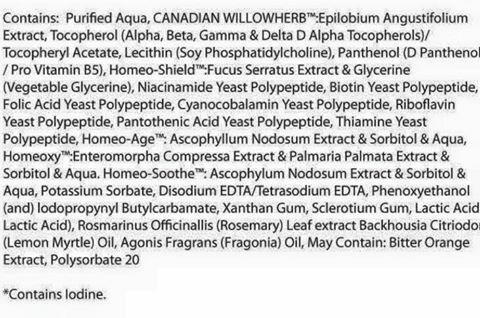 So after spending some time researching cosmeceuticals at our aesthetics conference this weekend, I decided to investigate the current formulas being marketed as having ‘active’ ingredients. I stuck on the Cosmo Detective hat and strolled around the stands in the Cosmetic Trades Hall to get to the bottom of things. I also sat through an afternoon presentation of recent research papers, which happened to address pretty much all of the ingredients I have decided are worthy to be deemed part of the Do What Works portfolio. Here is the ingredient list from one of the most popular ranges on the market. The company has aligned themselves with medical practitioners in its branding. Yet, there is only ONE thing in this with scientific evidence in anti-ageing skin care. And there is no concentration provided. I am aware that this ingredient had only been studied in anti-ageing at a specific concentration! There were studies presented hot off the press on the weekend which were forced to list the concentration of this ingredient. So what’s the secret? Why is it not disclosed?! I think it is because it is not strong enough. Reality is, the space in the jar is taken up with stuff to make it smell and look nice. I’ve done away with this stuff. I am wondering whether it is actually harmful. So when I use this science-backed ingredient, I use it in a stand alone formula. It doesn’t smell or look like these branded products. I accept it’s No Frills look. And my skin has never been better. My dermatitis finally settled without steroids. I haven’t booked in my microderm and IPL for the month. I actually now wonder if using these chemicals previously was the CAUSE of my dermatitis! Got questions about weird beauty ingredients? My literature searches are hot off the press and here for you guys. I studied formulation chemistry at university before medicine, so happy to assist with deciphering your ingredients! Always here to help dissect the murky mire of advertising in the beauty industry. Let me be your voice of reason!